WNYHeroes was proud to support a fellow organization working to assist Veterans in WNY. 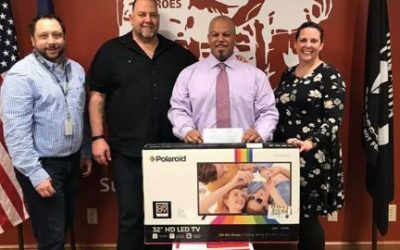 We presented the Hogs & Heroes Foundation NY Chapter 3 with a $1,500 check along with a 32” flatscreen HD TV and a Shop-vac, all towards their upcoming meat raffle. Thank you Christopher Gresham (AKA Lawman) for all that you do. 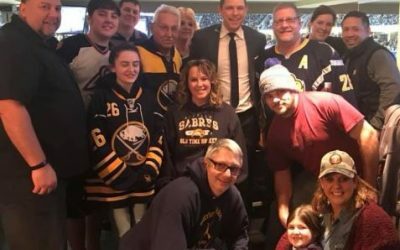 A group of Veterans & their “plus one’s” enjoyed a Sabres game and visit from analyst and former net minder Marty Biron. 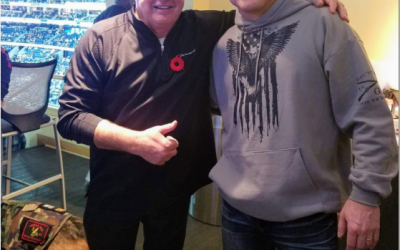 Biron, a naturalized American citizen, said “[The Veterans] were the highlight of the night…”. Marty was recently presented with a 3×5 US flag by WNYHeroes. 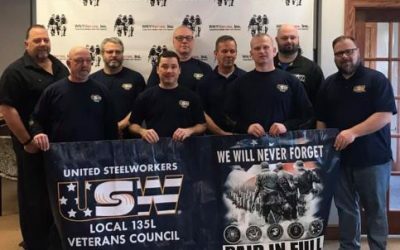 Cannot say thank you enough to our United Steel Workers local 135L Veterans group for their amazing support of $5,000 for our Pawsitive for Heroes Service dog program. Thank you for believing in us and changing the life for a Veteran. 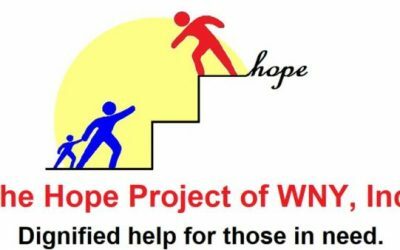 WNYHeroes is proud to announce our partnership with The Hope Project of WNY, Inc. watching their volunteers tirelessly organizing and working with wonderful people in our community in their beautiful space looking for assistance all while keeping their dignity! 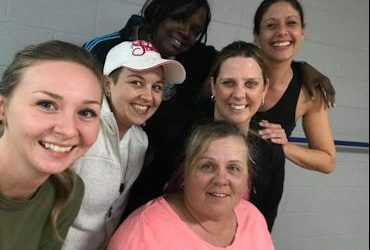 The Volunteers need to be applauded, and their fearless leader Dee should be applauded as well for her tireless efforts to keep her organization growing and putting herself last in HOPEs of helping yet one more family! Proud to work closely with all of them, knowing they will help assist our veterans and others right here in WNY! Welcome Lacey to our Pawsitive For Heroes Program. 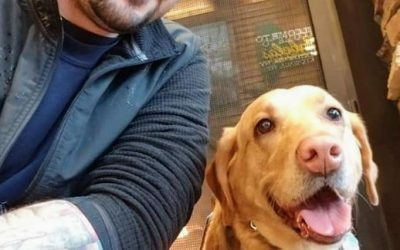 Lacy will be joining the ranks of over 30 properly trained service dogs in WNY. We know you will be taking great care of your veteran human and be by his side in good times and bad! Congrats to you both! And thank you for your service Michael! Thank you Miss Karen for the awesome continuation of our kickoff for our WNYHeroes Health and Wellness 2019 event on Feb. 2. Dozens of people took part in this inaugural event at our office in Williamsville. Events like this remind us all that staying active as time goes on can be challenging, but our veteran community is up to the challenge! Pilates classes will meet Monday nights and other health & wellness activities are coming up! 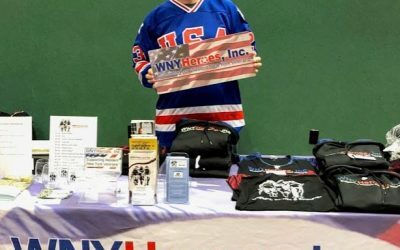 There was lots of neon, rubics cubes, and hair band music on February 1, and WNYHeroes was there to educate, inform and offer one lucky raffle winner 10 lottery tickets! We also had a chance to make some new friends, like a former Huey helicopter crew chief, and a retired lieutenant colonel from the Army’s 101st Airborne division! Red Osier, Red Osier, Let WNY Veterans Come Over! 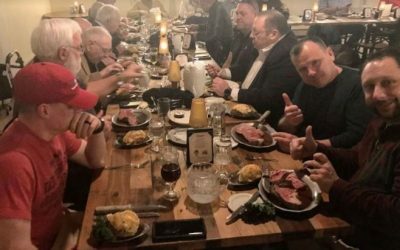 February started off well with 40 local Veterans eating like kings at Batavia’s Red Osier restaurant. A good time was had by all. January 14, 2019 provided WNYHeroes with the perfect opportunity to say “Thanks” to at least some of our partners and backers. 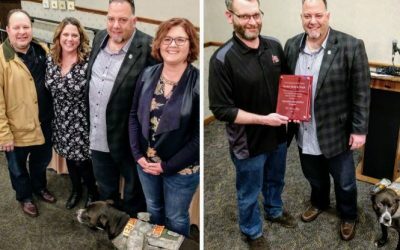 Rob and Kristi Moore (top left) can reaffirm anyone’s faith in the goodness we all possess with the work they do, as does Dan Hansel (top right) of Amton Auto & Truck, Cliff Kenzia (bottom left) of Kenzia Tire & Auto Service, and Pat Brown (bottom right) of HSBC’s Valor initiative. 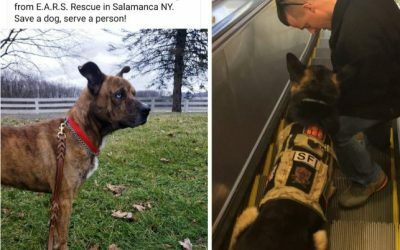 Empire Animal Rescue Society out of Salamanca, NY has provided WNYHeroes with our newest service dog. In the not-to-distant future, the dog on the left will be paired with a Veteran and begin training, like the one on the right. Proper training is critical because trained or not, if a dog misbehaves, business owners do reserve the right to have a dog removed from a given establishment without fear of legal retribution. That’s why our dogs go through a lengthy and rigorous training regimen, the cost of which is covered by our Pawsitive For Heroes program thanks to the generosity of local private and corporate contributions. This program gets no state or federal assistance. 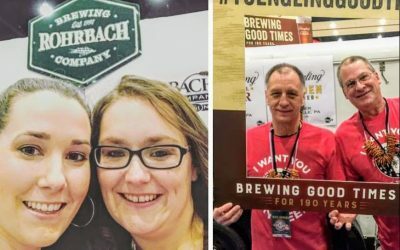 January 12, 2019 saw 200 WNYHeroes volunteers, including Danyel & Jade (top left) lending a hand at the Buffalo / Niagara Convention Center. Thanks to our dedicated supporters, lots of beer was poured, good times were had, and a donation was made toward our programs. The crowd was well behaved. Did you know the Defense Authorization Act of 2009 allows U.S. veterans to render the military hand-salute during the national anthem? Previously, hand-salutes were permitted during the raising, lowering, or the passing of the flag while wearing their organization’s headgear. Now that the guidelines have expanded, feel free to exercise your first amendment right while others do the same.